In the busyness of life, it's important to be able to get quiet every now and then. Every thought that you "think" has an energetic ring to it and when you're doing energy healing, those thoughts could get in the way. How do you become aware of your thoughts and calm your mind completely? You learn more about Chakra Energy Healing. Being able to calm your mind helps you to become more aware of messages that could come through or should I say, that will come through the more you practise working with Chakra Energy Healing. This is energy we're dealing with here. When you have your hands on or over a person to check or clear or balance chakra energy, what you're working on there is the energy field of a person. If you have a noisy mind while doing this, you are not allowing quiet space for any "messages" to come through to you. You are an energetic being and when you are working on the energy field of another person, your energy fields intermingle. This is how you can gather information to pass on to them or, if you are working on your own energy, you can also gather information for yourself and your own personal growth. Fast track your healing abilities and fully realise how you are affecting your chakra energy and how you can change it all. Bring your entire body back into complete energetic balance by clearing and recharging your energy centres. 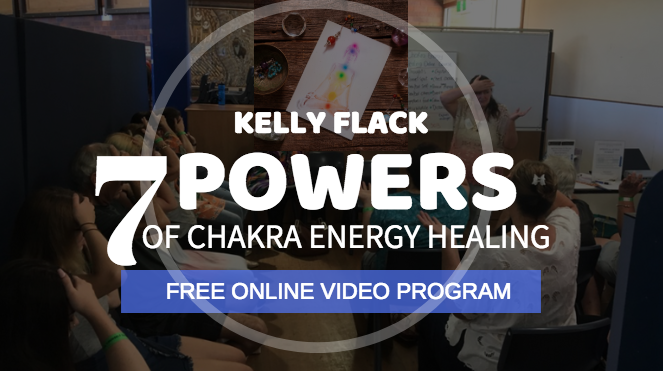 During this comprehensive online course, Kelly will give you the tools, strategies and a clear map so you can stay on track and achieve chakra energy healing for yourself and others in the shortest possible time. If you have missed any of this free online video program, you are welcome to sign up here.